Once in a while, you see a perfect gig. A charismatic singer, an incredible band, a receptive audience. This was one of those shows. 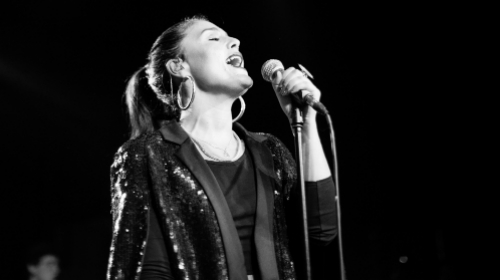 Like her music, Jessie Ware spent much of the night in the shadows. She didn't have (or didn't want) a follow spotlight, flitting in and out of the dark - encouraging us to follow her voice around the room. And what a voice. She's equally comfortable with a Nutbush rasp or an operatic crescendo. Sensuous, gorgeous, striking, beautiful. Playing a second sold-out night in her home town, Ware was understandably giddy. "I'm in heaven," she told the audience. "I saw my first ever gig here - Another Level!" Later, she spotted a couple at the front of the crowd who'd been following her tour around the UK. "You're crazy!" she scolded. "You've been to Manchester, Birmingham... You're going to get bored!" There was no chance of that. Irresistible on record, Ware's music is even more seductive in concert. Her three-piece band added a touch of warmth to the polished grooves of Night Light and If You're Never Going To Move, while Ware playfully cued up backing vocals on a sample pad. Drummer Dornik Leigh won a few fans of his own, as he subsituted for Sampha on the sweet soul duet Valentine. "I have a fabulous singing drummer," noted Ware, "just like Phil Collins". Other highlights included new song Imagine It Was Us (inspired by Janet Jackson, although it sounded more like Cherelle to me) and No To Love, backed by the 40-piece Goldsmith Vocal Ensemble, which transmogrified into Marvin Gaye's I Want You. Several times, the 28-year-old stopped to point out people who'd inspired her - including best friend Sara, the subject of Wildest Moments, and brother Alex, responsible for Taking In Water. During the latter, Ware choked on her hair ("don't you just love it when you get hair stuck in your throat when you're doing a really big ballad?") but it was tears she was choking back at the end of the night. "You're making me cry!" she said. "My dreams are literally coming true." "Oh my God, I sound like Gwyneth Paltrow. Shut up!"